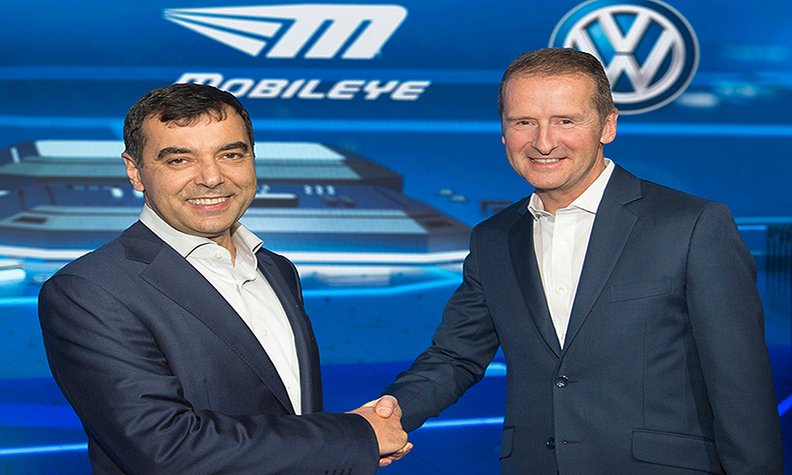 Mobileye Chairman Amnon Shashua with Volkswagen brand chief Herbert Diess. Their deal marks the first time an automaker is using Mobileye's mapping technology, known as Road Experience Management. Volkswagen Group is teaming up with Mobileye to create a navigation system for autonomous vehicles. The automaker said on Monday that it would use Mobileye’s camera sensors and localization technologies on upcoming vehicles, allowing both companies to collect road data, like lane markings and construction signs, for cloud-based realtime maps. The constantly updated navigation system can be used to develop advanced driver assist systems, and eventually, self-driving cars. “The future of autonomous driving depends on the ability to create and maintain precise high-definition maps and scale them at minimal cost,” said Amnon Shashua, chief technology officer at Mobileye. The partnership with Volkswagen marks the first time an automaker is using Mobileye’s mapping technology, known as Road Experience Management, in its vehicles. The sensor supplier said it is hoping to sign similar agreements with other automakers to increase the amount of data collected and create more accurate maps. In December, Mobileye said it was collaborating with intelligent mapping company Here to share road and navigation data. The agreement with Volkswagen, signed on Feb. 10, will go into effect in 2018.